The body of one of the 15 trapped miners, which was fished out on Thursday by the rescuers, will be kept at the morgue of Khliehriat Community Health Centre in Meghalaya for identification by relatives. Spokesperson of the rescue operation R Susngi said this on Thursday and added that inquest has been conducted by magistrate in presence of Deputy Commissioner and medical officers. Joint teams of Indian Navy, NDRF and civil administration officials pulled out the body of miner on Thursday . The body, which was detected earlier in the mine, had slipped from the grip of the Indian Navy’s underwater remotely operated vehicle (ROV). “The body is decomposed but yet intact. The body of miner was packed and pulled out from a depth of 170 feet in the 355-foot deep main shaft of the mine. It was taken to the civil hospital immediately for the post mortem,” said R Susngi adding that it is yet to be identified. 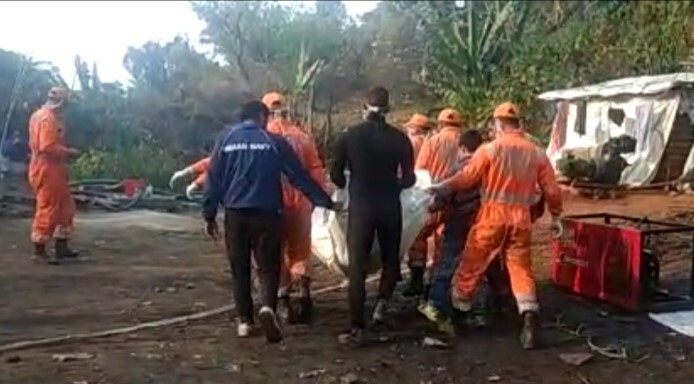 Meanwhile, search is on to locate the other miners who were also got trapped inside the mine on December 13 last year. The mine got flooded due to some puncture from a river when the miners were still working. The rescuers on Thursday said that the fire service Odhisa operated their pump for 6.5 hours from 10.40am to 5pm and the total discharged of water was 5,85,000 litres . The CIL pump out the water from two old shafts from Wednesday evening till 5pm of Thursday and a total of 27.5hours and the total discharged is 3118500 litres . The KSB Operate their pump from 7 pm on Wednesday till 5pm of Thursday evenings and a pumping time 14.5 hours. The total discharge of water was approximately 2771000 litres.